Prosthetic joint infection generally requires removal of implants, but infection of prosthetic hip joint caused by Yersinia enterocolitica can be treated by debridement and antibiotics. 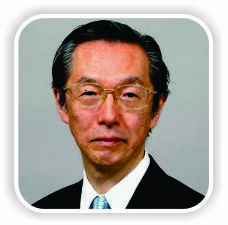 Department of Orthopaedics, Kyoto City Hospital, Kyoto, Japan. 2-1 Mibuhigashi-Takadacho, Nakagyoku, Kyoto city, Kyoto Prefecture, 6048845, Japan. Introduction: Yersinia enterocolitica(YE) is a common cause of gastroenteritis but rarely causes infection of prosthetic joints. Only one case report of YE infection after total hip arthroplasty and three cases after total knee arthroplasty have been published in English literature. 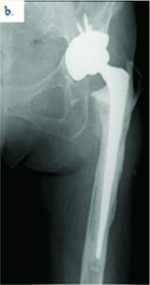 Case Report: We report a case of YE arthritis occurred on a prosthetic hip joint in 62-year-old female 13 months postoperatively. This infection was successfully treated without revision arthroplasty, and the patient is asymptomatic at 24 months follow-up. Conclusion: This case and previous reports suggest that YE infection of prosthetic joint is well treated with debridement and may not require the removal of implants. Keywords: Yersinia enterocolitica, Infection, Total hip arthroplasty. Yersinia enterocolitica (YE) is a well-recognized Gram-negative bacillus-shaped bacterium which causes gastroenteritis with some symptoms such as fever, nausea, and diarrhea and is a very rare cause of arthritis. YE infection on the gastrointestinal is self-limiting and does not require specific treatment. We searched PubMed and found only one case report of YE arthritis after total hip arthroplasty (THA) and three of total knee arthroplasty (TKA) published in English literature [1,2, 3, 4]. We present a case report of YE arthritis after THA which is successfully treated without revision arthroplasty. A 62-year-old female with a medical history of diabetes, hypertension, atrial fibrillation, and hyperlipidemia came to our hospital because of fever and pain on the left hip joint. She underwent cemented THA on the left hip joint with transtrochanteric approach at 61 years old (Fig. 1aand b) and the symptoms appeared suddenly 13 months after the operation. On admission, her body temperature was 38.4°C,and the left thigh was swollen and tender, but sinus tract is not seen on her skin. Blood examination showed her white blood cell count was 9490/µL (reference range in our hospital is 4000–8500/µL) and C-reactive protein (CRP) was 24.7 mg/dL (reference range is <0.5mg/dL). Loosening of the implants was not seen in the X-ray photograph (Fig. 2); however, magnetic resonance imaging showed high-intensity area around her left hip joint and gluteus on short-TI inversion recovery (Fig. 3aand b). We tried arthrocentesis, but very poor amount of synovial fluid appeared. Hence, we performed synovial fluid culture,but cell count was not available. She was started intravenous ceftriaxone (CTRX) 1 g/day from the day of admission after collecting of samples of blood culture, but both blood and synovial fluid culture turned out to be negative. To identify the causative bacterium, we remove the wire in her greater trochanter and debride granulation and synovia on the 26th day. From multiple pieces of the trochanteric wires, granulation, and synovia, YE was detected, and it was susceptible to CTRX. We suggested revision arthroplasty to her, but she never agreed because the symptom subsided, so we continued treatment by antibiotics. Her symptoms subsided, and CRP kept negative so we changed the antibiotics to oral ciprofloxacin which was susceptible to the causative bacterium on the 61st day and we continued the treatment to the 74th day. She discharged on the 76th day. No recurrence has been seen in 24 months after the discharge (Fig. 4). Infection of a prosthetic joint is often caused by Gram-positive cocci such as Staphylococcus epidermidis, Staphylococcus aureus, and so on . YE infection of a prosthetic joint is very rare. We searched PubMed with the words of “YE arthritis knee” and “YE arthritis hip,” and found that only one case of YE infection after THA and three cases after TKA have been published in English literature [1, 2, 3, 4]. 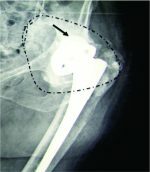 In the case of hip infection, retention of the prosthetic joint was tried by injecting antibiotics, but infection recurred, and then revision arthroplasty was performed . In contrast, infection was successfully treated without revision arthroplasty in three cases of knee and recurrence is not reported [2, 3, 4]. The guidelines by the Infectious Diseases Society of America recommend debridement and retention of a prosthetic joint only if the case meets the following conditions; duration of symptoms is shorter than 3weeks,or joint age is lower than 30 days, the prosthetic joint is well fixed, sinus tract is absent, and the agent is susceptible to oral antibiotics . In this case, CTRX therapy started on the 1stday of the apparition of the symptoms. YE was found from the trochanter wires removed on the 26th day, and this germ was verified sensitive to CTRX. Furthermore, roentgenographic loosening and sinus tract were not seen. These conditions seemed to lead our treatment to succeed. In the literature, three out of four cases of YE prosthetic joint infection were successfully treated without joint removal, so there is some possibility that YE infection on prosthetic joint responds well to antibiotics and debridement. 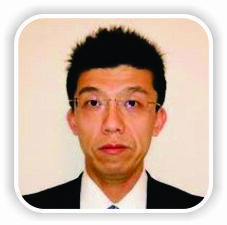 Further studies may reveal the character of prosthetic joint infection by YE. We describe a case of YE arthritis after THA which is the second case reported in the literature. Antibiotics treatment was performed with the prosthetic joint retained and no recurrence has occurred. Acute infection of YE on prosthetic joint responds well to antibiotics treatment and may not require revision arthroplasty. In most cases of prosthetic joint infection, revision arthroplasty is required. If the causative bacterium is YE; however, infection can be treated by debridement and antibiotics. Further studies are essential to elucidate the character of YE infection on the prosthetic joint. 1. Hougaard K, Søgaard P. Yersinia enterocoliticacoxitis after hip replacement. A case report. Acta OrthopScand1990;61:364-6. 2. Oni JA, Kangesu T. Yersinia enterocolitica infection of a prosthetic knee joint. Br J Clin Pract1991;45:225. 3. Iglesias L, García-Arenzana JM, Valiente A, Gomariz M, Pérez-Trallero E. Yersinia enterocolitica O:3 infection of a prosthetic knee joint related to recurrent hemarthrosis. Scand J Infect Dis 2002;34:132-3. 4. Jalava-Karvinen P, Oksi J, Rantakokko-Jalava K, Virolainen P, Kotilainen P. Yersinia enterocolitica infection of a prosthetic knee joint. Case report and review of the literature on deep sited infections caused by Y. enterocolitica. Adv Infect Dis 2013;3:95-9. 5. 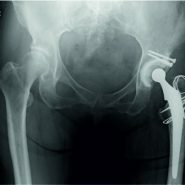 Ammon P, Stockley I. Allograft bone in two-stage revision of the hip for infection. Bone Joint J 2004;86-B:962-5. 6. Osmon DR, Berbari EF, Berendt AR, Lew D, Zimmerli W, Steckelberg JM, et al. Diagnosis and management of prosthetic joint infection: Clinical practice guidelines by the infectious diseases society of America. Clin Infect Dis 2013;56:e1-e25. 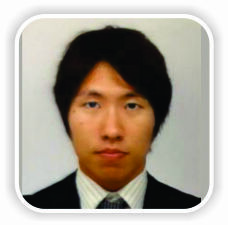 How to Cite This Article: Maeda T, Tanaka C, Shirai T. Yersinia enterocolitica Arthritis after Total Hip Arthroplasty – A Case Report. Journal of Orthopaedic Case Reports 2018 Nov-Dec; 8(6): 24-26. April 1, 2016 Qivas Therapy for Treatment of Implant Associated MDR Bacterial Infection.